Lupang Hinirang, the national anthem of the Philippines is played or sung during flag ceremonies in schools and offices, “signing off” and “signing on” of broadcast stations, before the initial and last screening of films, and other official or important occasions. Though it is expected that the national anthem be sung with utmost fervor, every Filipino must do so with utmost respect as well. Moreover, according to Section 38, the attending public shall sing the anthem whenever it is played at a public gathering. While doing so, the public shall stand at attention facing the Philippine flag as a sign of respect. The other provisions on the national anthem are detailed in Chapter II, Sections 35 to 39 of R.A. 8491. 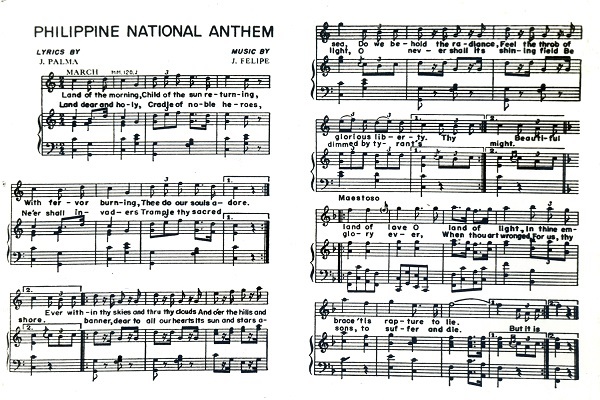 The development of the Philippine national anthem into what it is today took several years. It began in 1898 with Julian Felipe’s composition titled Marcha Nacional Filipina (also known as Himno Nacional Filipino). In 1899, Jose Palma’s poem Filipinas was used as lyrics which were later translated into English in the 1920s. It was translated into Filipino in 1956 and the version which is now sung publicly is a product of revisions made in 1962.